Indianapolis - Retha June York, 81, went home to be with her Lord and Savior Friday, July 6, 2018. Mrs. York was born March 8, 1937 in Louisville, KY to the late Arlie and Mittie Brock. She lived in Mayking, KY for a short time until her family moved to Norton, VA where she grew up. In 1954, after high school, she traveled back to Mayking, KY to help care for her sister-in-law and her new baby. There she met and married Carl York. The newlyweds moved to Indianapolis, IN 1955 and started their family. Mrs. York resided in her beloved Irvington home for over 50 years. She served her family as a homemaker and spread her love for children through babysitting. 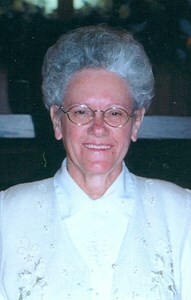 She attended Christian Tabernacle for many years and loved her church family very much. Mrs. York was preceded in death by her beloved husband, Carl York; her parents, Arlie and Mittie Brock; 4 brothers, 5 sisters, 1 grandchild and 2 great grandchildren. She is survived by her daughters, Deborah Gosman and her husband, David and Retha Kutche and her husband, Jerry; sons, Richard York and his wife, Janie, Billy York and his wife, Tammy, Jimmy York and Bobby York and his wife, Brenda; sisters, Victoria Blackmon, Arlene Walsh, Peggy Ping and Ellen Peeler; 10 grandchildren; 24 great grandchildren; and many other beloved family members and friends. Mrs. York’s family will receive friends Wednesday, July 11, 2018, from 4 – 8 pm at Newcomer Cremations, Funerals & Receptions, 925 East Hanna Avenue, Indianapolis, IN 46112. A celebration of her life will be conducted Thursday, July 12, 2018, at 10 am at the funeral home. A committal service will follow at Washington Park North Cemetery, 2702 Kessler Boulevard West Drive, Indianapolis, IN 46228. If you would like to share a memory of Mrs. York, or a special message with her family, please click the “Share Memories” icon above. Add your memories to the guest book of June York. Sis York was a very dear and kind lady. Always had a praise for the Lord ! Even in her aches and pains she had her sense of humor. Ol Arthur would try her but she knew some day she would send him on down road for good! I remember how she loved her flower garden. After her husband died, she took on the care duties of her sister in law Christine. She would bring Christine to church, always looking so nice. There's a reward for you in Heaven Sis York! May the Lord comfort her family. He is truly able. So sorry for your loss! Enjoy the memories and stories from friends and family at this time. They are the BEST!! Thinking of you and your family at this time. Jennifer D. from your ATR family! Goodby my precious friend.We will meet again and there will be joy instead of pain.I love you,I shall miss you. I’ve always known Sis. York, as she went to our church. But I was privileged to get to know her a little better these past few months. My grandmother and I would go visit her on thursdays at Crown point. Sis. York was one of the sweetest women I know. Very soft spoken and kind. A perfect example of how a Godly woman should act. She will not be forgotten. My prayers are with the family. Love you Sis. York and Lord willing I’ll see you again one day! You were the best Nana anyone could ever ask for. I know you’re in a better place now. I love you.